Sedgeford01485 532610work VillageSedgeford is situated about 3 miles south east of Hunstanton and is located in the Norfolk Coast Area of Outstanding Natural beauty. The village lies in a fertile valley in the belt of chalk covering this area, with a small river running through it. The village is recorded in the Domesday Book in 1086. 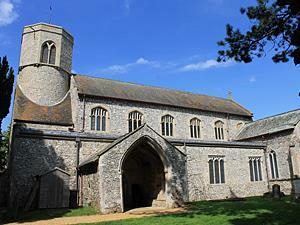 Part of the church, built of flint and stone, is Anglo-Saxon in origin. Archaeological evidence shows that people have lived in the locality from much earlier times, with remains of Roman villas, pottery and a gold torc from the Iron Age and many earlier artefacts, like the Neolithic flint tools which are found in fields and gardens. The village has two churches, St Mary's and the Methodist Church. The village pub is the King William IV. National cycle route 1 passes through the village and the Peddars Way passes just outside the village.